Yesterday marked a significant milestone for Lovin’ Spoonfuls — we rescued and distributed our 10,000,000th pound of fresh, healthy food. 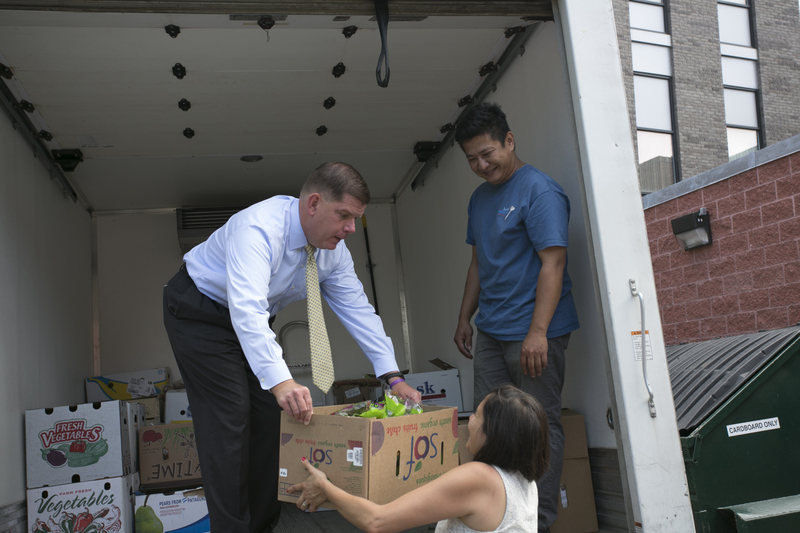 I’m incredibly proud that we were joined by Mayor Martin J. Walsh, members of our Board of Directors, and City Officials as we gathered at Rosie’s Place, where our Food Rescue Coordinator Reggie made the handoff. Rosie’s Place was one of our earliest beneficiaries in our first year in operation, and today we came full circle. Lovin’ Spoonfuls began in 2010 as a simple response to the tremendous amounts of food going to waste. As we slowly began to grow, we held our founding principles close. To serve with intent and purpose, without duplicating efforts, to inspire larger output and outcomes from our partners in the space. At its core, Lovin’ Spoonfuls has always been about relationships. Even with sophisticated technology, strategic logistics and a practical approach to distribution — everything comes back to our partners. Our vendors and beneficiaries work within our program, creating a streamlined, efficient and capable network. As we celebrate 10 million pounds, we are grateful for the deep partnerships we have, and the ones we continue to cultivate. Lovin’ Spoonfuls continues to grow with a dedicated staff that shows up in 100-degree heat, and 0-degree windchill. As a team, we believe that what we cultivate within the organization allows us to serve our community with integrity and commitment. You can learn about our team and what ‘drives’ them here, along with news and updates throughout the year. You, our donors, are truly an invaluable part of this effort. Your support in any amount goes directly to our mission, and we recognize you as a part of the Spoonfuls family. Our partners in hospitality, led by our esteemed Culinary Panel, continue to show generosity beyond measure through events like The Ultimate Tailgate, Season and so many other efforts throughout each year. Our Board of Directors inspires leadership, creativity and excellence. The Friends of Lovin’ Spoonfuls, led by the Friends Advisory Board are energetic, passionate and committed to volunteer work on our behalf. Now that we’ve celebrated this momentous occasion, it’s time to get back to work. We have a list of agencies waiting for our services and the food we provide, but we need to grow in order to reach them. Please, consider taking part in our $10 for 10 Campaign to Fight Hunger, which marks our 10 million pound milestone, by making a donation and sharing with your network. We continue to be humbled by our supporters and partners — thank you for helping make yesterday’s milestone a reality.